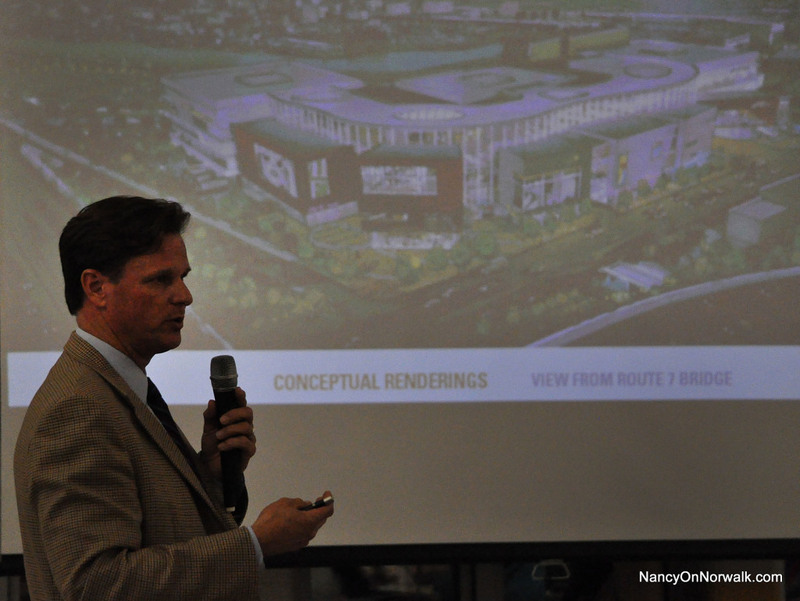 Doug Adams of GGP (General Growth Properties) talks to the West Norwalk Association last week. NORWALK, Conn. – The hottest trend in online marketing these days is to open up an old-fashioned bricks and mortar store, according to the Financial Post. That sentiment was one cited by Doug Adams of GGP (General Growth Properties) last week as he tried to assure members of the West Norwalk Association that the age of the mall is not dead. “We see strength. In the retail industry, retail is challenged overall, we see good retail in good places doing better,” Adams said. “For people, it’s a social activity. Online retailing is about six percent of our overall sales. I can tell you that online retailers are opening – Amazon is opening a story in New York. It’s been around long enough, you’ll read more and more about it. I’ll give you an example. There are locations where, I think it was Macy’s, had a strong online business. They chose to try to close a store. Within five years, the sales in online for that area tanked. I don’t mean they went down. I mean they tanked. They then moved to reopen the stores. A little bit of research online quickly turned up information. “Two-thirds of online consumers interact with the brick-and-mortar store at some point along their path to purchase… we cannot only measure a store’s importance by how many actual transactions are made within it,” according to an article on Thriving Malls, a GGP blog. Macy’s has posted $1 billion in revenue growth through online sales, according to Quartz, described by Atlantic Media as a digital guide to the new global economy that launched in 2012. Most of Macy’s core brands aren’t found on Amazon or anywhere else, and shoppers go to the store to try on clothing and then order online, the article states. About 15 years ago, Internet retailers raised seed capital for their businesses as predictions that malls were dead circulated but went bust, according to the Financial Post. But while Amazon is opening a store in New York City, according to the Wall Street Journal, Wired suspects it will be there as more of a mini-warehouse to service same day deliveries of groceries than as a place to shop. Wired also speculates that having a big sign on one of the country’s most traveled roads, 34th Street, will be great advertising for Amazon and the company will be able to showcase its own products. Adams provided NoN information to support his statements in two documents written by A.T. Kearney, a global management consulting firm. They are attached below. “The first piece, titled ‘9 Things You Should Know About Malls and Mall REITs,’ has some information that is focused directly on GGP’s segment of the industry,” Adams wrote. “Here are a few headlines from pages 12-21. “The second piece, “On Solid Ground,” speaks more directly to the importance of brick-and-mortar stores in the retail landscape,” Adams wrote. “1. Only 5 percent of U.S. retail sales are pure-play online sales. Five percent are multi-channel online sales (i.e., a visit to the store resulting in online purchase from store’s website); 90 percent are physical store sales. “2. Overall, consumers prefer in-store pickup to home delivery. GGP at the cutting edge with its Same-Day Delivery service created in partnership with Deliv. “3. Retail is following a ‘click-to-brick’ path. Many retailers incubate online and then open stores: Warby Parker, Bonobos, Athleta, and Boston Proper are prime examples. Adams comments at last week’s meeting stemmed from a question about the potential of GGP building part of a mall in South Norwalk and then letting it decline into a vacant dilapidated half-built eyesore. “We are investing our money to build it all at once. We’re not going to be testing the waters. It doesn’t work. We can’t build a little piece of it and see what happens so we’re going to build it all. That will require commitments,” Adams said. GGP has relationships with every major retailer, he said. If they put in a Macy’s, it had better provide vastly better customer service than the Stamford store. The last few times I shopped at the Macy’s in Stamford, the service was abysmal. (1) I needed a gift box for a small item I’d purchased. I got sent to 3 different locations on at least 2 different floors, having to wait in line each time. Finally a clerk said the reason I was getting the runaround is that nobody wanted to go to the storage area in the back to find a gift box — and then he was nice enough to go and do that for me. (2) I wanted to buy a china item and the one on display was chipped, so I asked if they had one that wasn’t chipped. Clerk tried to tell me the chip wasn’t that noticeable so I should just buy the display item. I said no. Then he said I could have the item (not the chipped one) sent to my home, so we started to fill out the online form to do this. Clerk didn’t know how to fill out the form. Another clerk needed the register so we had to move to a different register and start over. Then we got to the payment part, and he said I could not pay cash. At that point I said forget it, I’m not buying this item. Clerk practically chased me to the door trying to get me to change my mind. With this kind of lousy customer service it is amazing they are still in business at all. Go to the store to examine the merchandise, then go home to make an on-line purchase. Do you charge an admission fee to pay the rent? H.F.C. Lets hope we have thoughtful discussion on the “winners” of the proposed mall (investment firm landlord, chain stores, regional shoppers, CT sales tax) and the “loosers” (traffic congestion downtown, loss of local firms, lost opportunities for a more comprehensive development, congestion from the years long construction, and eventual removal of the mall. So far not much informed discussion here. Click-to-Brick? Interesting justification. If you substitute the “click” for catalog you’ve recreated the old Service Merchandise and Consumer Distributors stores as a primary reason to build a mall. Oh forgot, those stores are now defunct. Or perhaps, once the mall fails it can be used as a warehouse and launching pad for drones to deliver packages to consumers. Notice whose blog it is that is promoting brick and mortar stores. None other than GGP, the builder of such places. http://www.cnbc.com/id/101205503 shows the percentage of shoppers who will be shopping online per a report by Deloitte. Just a quick spoiler: online shopping is quickly overtaking brick and mortar AND very few people go through the scenario as explained by this GGP presenter of securing their item through a store for pick up versus shopping online. Notice the study cited by the GGP Presenter is very slim on percentages or factual information. Or the “facts” presented can be refuted depending upon what resource you consult. So it was in 2009. We’re talking billions of dollars in debt that had to be “reorganized.” How “healthy” is this company if it had to go in arrears on some of their “prime” properties? “Overall, consumers prefer in-store pickup to home delivery.” Really? Just who is GGP talking to that would validate this claim? What percentage of consumers? The Internet is rife with reports on GGP’s bankruptcy filing (the largest of its kind) and I have to ask – just how “recovered” could they be in five years? Mr. Adams’ claim that “We have the staying power” based on the last three years does not bode well for a long term success in a Mall in Norwalk. There are alternatives. Don’t drink the Kool-aid. Do you honestly believe that GGP is spending millions to fail?? ?I would think that the professionals at GGP do a bit of research before they build. You don’t want a mall we get it, but please with the propaganda. The mall will be built, GGP owns the property and the mall conforms to the code. My question is we haven’t seen those alternatives in 15 years. What makes you think now we will see them? I Cant wait until opening day!!!!!!! It’s funny when you try to be provocative WjW. Have you not been reading the threads about alternatives? I suggest you study up. GGP only has to be in the business as long as it is profitable for them. They can pull out to the lowest bidder anytime a Mall does not succeed on their terms. The above is no more propaganda then what GGP is spewing. They know how to pay for and publish studies just like countless others. Except, WSJ and other WEB Content sites don’t and therefore have no vested interest in profitability but in perspective. Why is that propaganda? Do your homework WJW. Then you can yell at me – but with supporting facts please. Otherwise, it’s just silly. Hey wow, pretty sure a mall does not conform to the code. The previously approved 957 plan was granted approval after years of haggling with the city and multiple revisions. I’m not an expert but it’s my understanding that a ‘Land disposition agreement’ is special permission to build outside of standard regulations if the city thinks its in the best interests of norwalk. So, yes ggp owns the land but norwalk has a lot to say about what they can do with that land. In fact by buying the land they were taking a gamble they would get permission to build a mall. I suspect there is something a well funded team of lawyers could do to get their way in court but again, I’m not sure exactly how it works. I think the common council has to vote to approve the plan in the end. Our elected representatives :). Anyone know how much norwalk can influence the outcome and how it works?? I would love for this space to be successful, and certainly retail is going to be part of that. But a mega-mall? Sorry, but even with the “Amazon is opening (one showcase) store in Manhattan” is not evidence of the future success of brick and mortar retail centers. Oh, and Macy’s has been on a decline in terms of retail space for the last decade, so any cherry-picked evidence to the contrary is misleading. They will, and have shuttered stores across the country. This architectural fortress is the opposite of a multi-use, neighborhood-friendly space I thought was envisioned for West Avenue. I have yet to see any other suggested feasible use on this site, and I am an expert in this field. As I’ve stated before, if there were a feasible alternative I’d be all for it. The question really should be – what is the cost of not doing this? The LDA is a living document that needs to be tweaked to address changing markets. It is a bi-lateral contract. Not relooking this document to capitalize on market trends, long-term, would be a colossal blunder by the Common Council. Thankfully, they are smart enough to know this. The site has been a hole in the ground for 15 years.. That tells me no feasible alterative exist. Please list for us the ones that are busting down the doors at city hall to build on this site. GGP only has to be in the business as long as it is profitable for them. That’s true of any development/business office housing retail ect. I will be waiting for you list. I looked up the amount of acreage required of various sports fields last night and a variety of events could be held at this acreage (I only found reference to a “dozen acres”) with shared parking for the facilities. Semi-pro teams or minor leagues could play well-maintained fields and, instead of shopping, people could pay to see athletic competitions while also using the facilities, including a modestly priced indoor gym and a seasonal ice rink/skate board park and music and/or movie events under the stars from the Spring through the Fall. What’s that you say? No giant tax revenue from a depreciating Mall the minute it is put in the ground? No “lifecycle” building to leave for future taxpayers? I would suggest that this cultural/sports idea is far more plausible and long lasting in attracting crowds further than County wide and would be a consistent source of income that would not depreciate over time. It would appeal to the entire Norwalk and beyond demographic particularly if it held competitions not normally attracted to nearby venues but very popular: lacrosse, cricket, soccer. Since the river is adjacent, there is the opportunity for rowing competitions or facilities as well. So, instead of seeing a giant “Mall O’Wall” as I-95 drivers pass by, that everyone sees everywhere in the United States, this type in particular with a failing design concept everywhere including well heeled areas like Palm Springs and the Silicon Valley, one would see athleticism and concerts, out door plays, etc., all revenue building and all good for Norwalk employment, taxes, and cultural needs. If you’ll notice, I did not mention baseball for that very reason. Vets Park has public sports fields and is not appropriate to money making ventures for sports not usually considered but very popular as mentioned above. There are restaurants on Wall Street and in SoNo but that does not preclude anyone eating at anyone of them. Likewise, an outdoor rink (think Rockefellar Center) converted into a skateboard park (monetized) rather than an indoor practice venue as in SoNo would be more applicable to 95/7. I am not referring to “let’s go play a game of ball” type venues. I am proposing a multi-use facility that is monetized for multiple purposes – not just sports but also cultural events. Anyone can say “nay” right out of the gate: everyone has been asking for a better idea than a Mall. I am saying this is one of them. Over the long term and for future generations, for creating traditions, for creating money, for contributing to tax rolls, OVER THE LONG TERM, this is a better idea than the Mall whose model for development is being destroyed all over this country (Sacramento and Albuquerque are not part of the Rust Belt) and with a “lifecycle” as explained by a commercial real estate professional on these threads, that may last 25 years. In 25 years, athletes will still be competing there, concerts will still be held there, young people (and older) can still use the rink/skateboard facility, rowers can still compete, films can still be shown and it will be a great “connector” that everyone likes to talk about between the disparate city centers. It could also provide the revenues needed for SONO and downtown because of its adjacency to those places, i.e., go for a lunch before a game, go for dinner after a concert, pick up to-go for consumption during a film. Many parks with such series are kept afloat by such activities. No “Made ins…..” Just a Norwalk for Norwalk venture. I’m with you on the idea of a sports center. Genuine, well-built, affordable housing will do it. Better access to intra-city public transportation would help the drones get back and forth to the hives. More Mom and Pop stores would be a blessing, a periodic street market could be a real attraction, a public swimming pool with a bubble cover for winter, a working bowling center, a well-located, well supervised skating rink – whatever it takes to get people out to do something other than look at store windows for stuff they cannot afford. Let’s face it, our attempts at “affordable housing” are a joke. Even Habitat for Humanity’s offers to build such housing has been rejected. As for covered swimming pools, take a look at the Wilton YMCA. Their outdoor Olympic-size pool is in use 12 months of the year. Actually, we’ve already made a start in that direction with the Norwalk Sports Center, but it’s not located for easy access. All these things have great potential to cost less and add attractiveness than the option of more mortar and faux-bricks containing “luxury” apartments or another Big Box filled cheek to jowl with boutique stores that soon move on to greener pastures, replaced by sports cap outlets. I ask again…what towns would this mall be serving? One member of the zoning commission claimed this could be our “anchor”. We have 4 malls within a 25 mile radius every direction, not to mention high end open air shopping in nearly every surrounding town. How would a redundant mall be special for Norwalk? We can and should do so much better. We need to think outside the box. I love the suggestion of a multi-use outdoor sports and cultural events location. The thought of another straight-forward mall in Fairfield County is disheartening. As eCommerce continues to grow at its current pace on the national level, never mind its global growth, large retailers are scaling back on square footage and moving much of their business online. We need far more than just another place to shop that has an inevitable expiration date. There Wow on Wow, I’ve done your research for you. These alternatives provide plenty of plausible alternatives which would be longer lasting, nurture communal space during all seasons and be a long lasting contribution to Norwalk’s culture. They would not “expire” and have to be removed in 25 or even 50 years. They would not depend on a company that is counting the last three years as a real period of success and being “here to stay” in spite of their abysmal rating on NASDAQ as well as the “reorganization” in April 2009. The initial amount paid for the land? Monetize everything by sums that are not outrageous but earning money nevertheless. Get those tax breaks that GGP is enjoying and, as is pointed out in a report above, detracts from the health of communities they occupy. You don’t’ have to wait. You just have to think in terms of doable alternatives that aren’t being considered because of a rabid company that wants to make money, of course, but with an outdated idea of not only Malls but inaccurate contemporary ideas about Internet shopping as well as an outlandish idea about the number of people they expect to attract in spite of the number of Malls within a 25 mile radius as explained above. People are thinking and coming up with some good plans. What is yours, Wow on Wow, other than a failed before it starts big glass box with stores that can be found anywhere? @Suzanne – all good ideas but not feasible unless Norwalk wants to buy back the site for $35 million. Most of the uses you proposed require on-going subsidies unless they are given the land and tax breaks/incentives on building. That goes back to the question – what will this cost us not to do this? Why not focus your energy and landscape architect expertise on helping Norwalk create a truly world class mixed use neighborhood that extends from Washington to Wall Street? For that to happen we need the 95/7 Anchor that is designed in such a way as to be seamless in transition between Washington, 95/7, Wall. It needs to be street front oriented – open design that is pedestrian friendly with easy access to circulator trolleys. The design of 95/7 needs that type of input or it might become just another Wall O Mall. Mr. McGuire, There are companies that develop cultural and sports centers and run them for a return. Or, the development could be given non-profit status. Or, the sports income as well as special events could be well-publicized to attract people from all over and make money. Such a facility with attractive sports and entertainment is a huge draw from across counties. You know, I consider the Aquarium, a huge attraction apparently to many to and in Norwalk. They have been subsidized, have not had to pay their development bills, etc., and, yet, are roundly supported by the citizenry as a positive attraction to Norwalk. At the same time, we have the OHPA getting, essentially, “subsidies” for “loans” they do not pay and the City seems fine with it, in order to attract countywide play. Why not a creative approach to financing a cultural/arts/sports center that would serve everyone and be a joy to all from everywhere, anywhere USA? Everyone seems to want to bend over backwards for a giant corporate entity like GGP. Yet, this piece of real estate has been labeled as one of the most valuable in Fairfield County. In which case, the GGP Mall will be a value for a few and a repetitive development at best. This is the way to anchor Norwalk – not with a building of a relatively short shelf life with a dubious longevity in terms of money-making but with a place that can gather everyone together to pay an entry fee, yes, for all of the events but, also, to enjoy a gathering space with variety, originality, tradition and long term interest. This has seemed the attraction of the Aquarium. It is a successful model. Why aren’t we replicating it? What you are describing, BTW, with the street front oriented design and all around trolleys is – the Mall of glass with its jeweled windows. But, if you are not and I am misunderstanding it, maybe it is time to describe your alternative to the (a moniker given by another contributor but I do appreciate it) Wall O’Mall. Suzanne – the Aquarium on a stand-alone basis does not make money, it is subsidized. Why did the Bluefish and Sound Tigers go to Bridgeport? Cheap land. Why don’t we have more sports teams here – the land is to valuable. Why are Yankee Stadium, Shea Stadium, and the Meadow Lands located in out of the way places – cheap dirt. This is highly valuable land for really only one use retail. This parcel was going top be 1.1 million SF of office which would not work. Next was the mixed use development which would not work. A sports/entertainment venue is not feasible unless a pro football, hockey, baseball or basketball team was the draw and even then they would require huge subsidies. Shopping is free and you don’t have to sit in one seat to enjoy it. The bigger question is what adds incremental value to the city’s predominantly based residential grand list and the overall attraction to the city? Without a doubt anything but a mall and for that reason, I believe some of Suzanne’s ideas, if developed, would actually accomplish that. I just don’t see how a mall with the existing saturation of retail in the area would boost residential valuations with more traffic, congestion and minimum wage jobs. Sorry mall cheerleaders. Also, is it possible for NON to have a separate header for mall articles on the home page? This will be an active topic of discussion in the coming months. I don’t expect you to answer the question as the answer is No one has shown an interest in the hole in the ground. Shopping is free to who? Anyway you look at it, any venture will require money – from consumers, developers and the government. The Aquarium is subsidized because why? Because it successfully attracts people from both in and out of Norwalk to experience something different. I am saying use 95/7 as a venue for MULTIPLE activities with CROSS uses both through sports and culture. Shopping, especially this Mall concept, ends and is expensive. Lest we forget, GGP is not getting the privilege of their profitability for nothing. Norwalk is paying considerable dues for this ho-hum everywhere, anytime facility that is going through demise all over the US. Enjoying activities with other citizens and out of towners at a concert, play, Lacrosse game, rowing competition, ice skating, etc., yes, requires some help from Norwalk. But what is GGP getting from Norwalk in forgiveness of property taxes for their generous offer to locate this leviathan here within 25 miles of at least three other malls with all of the same stores that I can think of? How is this, LONG TERM, a good investment? Longterm, culture will still be with us, concerts, the less considered sports that have garnered interest in the North East and could use good venues for league play will still be with us. Just like the Aquarium that has seen excellent results for not only itself but for other businesses, this space could see excellent results for a lifetime not through a limited use facility with a limited lifetime like the Mall but for activities that everyone can share and enjoy, albeit with an entry fee as is required of other cultural venues. The only thing wrong with people’s thinking with this Mall concept is one track minds not interested in revenues through uses that make sense instead of a few cents that will dwindle over time if trends in the United States are correct and the Nasdaq rating for GGP remains low. I resent the implication that the only thing Norwalk is good for is a Mall that represents the profits and ideas of one company that, itself, could not keep high and dry when the financial downturn occurred in 2009 and had to file for bankruptcy. They are not even offering the architecture that is most appealing from their portfolio. I personally feel they are pawning off a relatively (to the rest of their portfolio) undesirable architecture because Norwalk, somehow, has to accept it. Norwalk deserves better. The citizens deserve better. A “connector” that truly connects ALL of the community IS better. WJW, You truly are hilarious. Everything is a New York shuffle with you. Ask one question, get an answer. Don’t like the answer? Well, WJW, you just change the question! Do your own research and get busy. Why don’t you quit asking the questions and come up with some of the answers? How about asking some of the Council members about the political will to do something different? Or maybe, ask the keepers of the LDA how they might realize something more effective than this UB (ugly box) for longterm fiscal and cultural stability? Too much for you? Oh! I know! Change the question! There is now a “mall” choice in the navigation bar atop the page. Thank you and look forward to your continued in depth coverage. WSJ: How about retail development? Mr. Ratner: Other than urban retail, I would argue that retail development is pretty much finished forever. Very few malls have been built in the last 10 to 15 years. The same thing probably is true for the strip-center business because of the Internet and oversupply. The Internet has slowly eaten away at 5% to 10% [of brick-and-mortar retail sales]. That’s a big margin. Urban retail’s a completely different business in places like New York and Chicago because of the density, and it’s impossible to find locations. Mall developers don’t need to produce a real result for the City in order not to fail. They will bank our tax abatements and other concessions, create low-paying jobs for out-of-towners, and pack our streets with traffic. Whether the City “fails” in this scenario is an entirely different matter. CC’s planning committee viewed this as pretty much tearing up and re-writing the LDA, not a “tweak”. Shopping, as conceived here, is anything but free. Paid parking, and time lost sitting in traffic are only the start of the costs here. To Suzanne’s point, would a Chelsea Piers North-North (since there is one in Stamford) work? Chelsea Piers is an indoor sports center which isn’t the concept at all that I am suggesting: outdoor sports competitions outside of the main “American sports” of baseball, football, basketball and arguably, soccer, but also cultural activities to include concerts, outdoor films, farmers markets, etc. This is what I mean by CROSS use: a field can be many things. Sports venue or a place where a large gathering can assemble for any number of things as mentioned. Chelsea Piers does not include this option which I think would make a huge difference in the usability and number of people and demographics that could be included in such a development. Thanks Suzanne. Interesting fact: Chelsea Piers has a driving range. Know what sport Chelsea piers decided NOT to put in its Stamford location? Golf. Are you talking about something like Gaelic Park in the Bronx? Another Interesting Fact: did you know that Gaelic Park has its own Wikipedia entry? What a find! I knew nothing about this venue. Time for a field trip! You know, I went to Chelsea Piers last year and asked them if they had a driving range, they said no, and I didn’t see one. Now I am wondering if my field trip yielded accurate information. I call it a Norwalk venue for Norwalk (and a draw from the surrounding areas.) A far cry from the proposed GGP Mall for GGP. 2. what occurs when you have feelings for someone [or something] (i.e., a mall) that are so extreme, and you describe them, but the other person (citizens) doesn’t feel the same way… at all. It is a mystery how the developers of this sight can actually believe they would have success building a repetitive mall. If one would analyze the traffic statistics of area malls, they are in major decline. Any potential store anchors are already here. Great spin though. @Suzanne, I mentioned the 4 malls within a 25 mile radius. We have Stamford, Trumbull, Danbury, and The Westchester in WP. Actually, I guess it’s 5 malls when you add in The Galleria in WP. Of those malls, the only one, in my opinion, that truly serves as a destination landmark is The Westchester for obvious reasons. The proposed mall is simply, redundant. Great ideas on a mixed use sports complex embracing the community. I hope we can have continued meaningful conversation re the use of this property and not settle on this average run of the mall as our “anchor”. It would be interesting to see poll results on how many residents favor or don’t favor this proposal. I have asked you the same question several time but you seem to be side stepping it for some strange reason. With all you list not one developer has come forward with an interest in any of your ideas in 15 years. Why would they now? Would you rather keep it as a hole in the ground??? One thing that I would add is that in as much as the mall needs to go forward. I would rather see it as an outdoor New England type mall. I don’t seem to remember anyone suggesting this. This without question would enhance the area vastly. Eve T. has been making the request for different architecture similar to what you suggest, WW, for months. I honestly don’t know who has been approached about the 95/7 development. That would be your job to find out, what you avoid, since you are so interested. @WJW It has been noted on this blog for weeks now that if a retail outlet were to move fwd, it would be in the best interest of keeping with the neighborhood. This has been noted several times.